Discussion in 'Non-India Related Domains' started by Prashant Sharan, Feb 1, 2019. Let's walk through the market performance of our market on 31st January, 2019. The top sale of the day was SelfieSticks.com which sold for $8,200 at NameJet. NameBio recorded 257 sales $100+ for a total of $155,029 with an average sale price of $603. Compared to the previous day there was an increase of 35% in the number of sales and the total dollar amount increased by 4%. We also recorded an additional 898 sales below $100 for a total of $20,516. The domain SelfieSticks.com sold for $8,200 at NameJet for a decrease of 72%. It last sold for $29,100 on January 23rd, 2015 at NameJet. The domain SiteSite.com sold for $376 at DropCatch for a decrease of 85%. It last sold for $2,500 on March 11th, 2008 at Afternic. The domain LittleGuy.com sold for $2,076 at GoDaddy for a decrease of 86%. 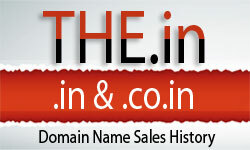 It last sold for $15,000 on December 20th, 2006 at BuyDomains. The domain TechMeet.com sold for $255 at NameJet for a decrease of 87%. It last sold for $1,995 on October 7th, 2012 at Afternic.